Many years ago, during my college years, I read John Lilly's accounts of sensory deprivation. The books fascinated me. The premise was to reduce sensory input and free the mind of the tasks of assimilating and processing sensory signals. The processing power of the brain could then be turned to the more subtle facets of the mind in a samadhi-like experience. He achieved this by floating in tanks filled with iso-thermal salt water within an isolation chamber devoid of light, sound and, effectively, gravity. His accounts included those of taking high doses of LSD in such environments and establishing mind-links with dolphins. It was the seventies, we were young, and such things seemed relevant to the world that some of us wanted to create -- the world never fully realized, but not forgotten. Finally, all these years later, I received the opportunity to try this out for myself. Tucked away in a small, suite behind the Venice Beach Boardwalk are two such chambers. They are operated by a scruffy, likable guy in dark, opaque glasses named Crash who enjoys talking about things such as altering the vibrational frequencies of DNA helices (or something of the sort). I spent 3 1/2 hours in one of Crash's sensory deprivation chambers the day after last Christmas and returned for a second session yesterday. The 3 1/2" thick walls of the chambers provide effective sound absorption, temperature insulation, and a solid light barrier. 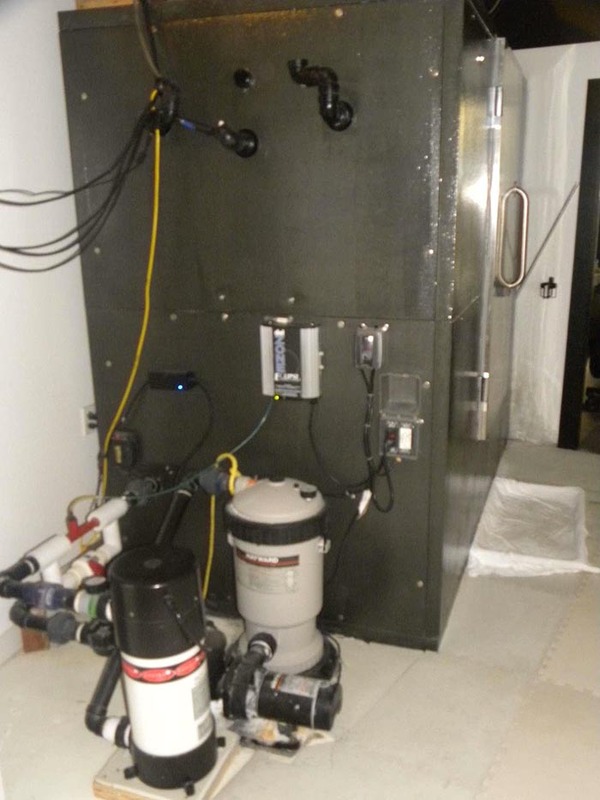 At the bottom of the chamber is 200 gallons of water dissolving 900 pounds of Epsom salts with a depth of about 12". The solution is temperature-regulated to 95 degrees to match the external skin temperature of the human body. Oxygen is pumped into the chamber to maintain a breathable atmosphere. After a quick shower, one steps inside, closes the door and lies down to float in absolute darkness to which the eyes never adjust. Floating is effortless in the high-density brine - even my long lean body buoys like a cork. The sentient overload of the human experience is confined. Yet, one becomes aware that it's a sensory-limited environment rather than one of full deprivation. Sensory awareness is actually enhanced in the low stimulus condition. One hears an occasional low frequency rumble from the street - then, one begins to hear one's own breath, gurgles from the digestive tract, the slightest ripple of water. There's a dank smell common to a warm, wet environment. The temperature of the water never seems perfect against the skin. The brain is still connected to the sensory organs and its response is to increase the gain to such super-sensitivity as to make one feel capable of cracking an old-fashioned safe's tumbler lock combination. I began my meditation -- placing awareness on my breath. It brought a familiarity and the final remnants of anxiety about the outside world faded away. I drifted in and out of the 5th jhāna. There were prolonged periods of clarity interspersed with periods of playfulness as I gently propelled myself back and forth through the thickish water. It was near tranquility except for a minor discomfort due to the water being a bit cool. As mentioned, I spent 3 1/2 hours in the first session -- I could never sit in lotus to meditate for that long without my spine decaying to dust. I spiced it up a bit this second session in the chamber -- John Lilly-style. As I entered, I put 4 dried mushrooms into my mouth, chewed, and swallowed as I entered the chamber, then waited with anticipation. Yet, the experience that unfolded was not the subtle state of clearity that I desired. If anything, the mushrooms energized me, making it more difficult to enter a state of samadhi -- perhaps, I needed to let go further to open to a different experience. I had the sense of being in a womb for much of the time -- warm, dark, moist, and the gurgles from digestion. Has the bardo ended? I emerged after two hours. Crash was going on about DNA frequencies with a new visitor. So, after a goodbye man-hug, I headed to the Venice beach. It was then that I realized that I was not in a normal state of mind. "Are those shark fins?" I wondered as I gazed out towards the ocean surf. No. They were dolphins -- how appropriate! They were obviously attracted by my expanded state-of-mind. I should have tried the mind link, but it didn't occur to me. It was the best of days! I spent the rest of the afternoon walking along the Pacific Ocean waves to the Santa Monica Pier and back. The sand, the water, the Southern California girls -- all so beautiful. That's when I remembered the mind link. With my concentrated mind ... I had the power to make the pretty girls sparkle. Ahhh, but in fact, that involved little more than appealing to ego - the dolphins would surely have provided a clearer subject. With practice, I have experienced deeper states of meditation sitting on a cushion. Yet, I can appreciate that this could be a significant aide once the mind has grown accustomed to it -- a cave for the modern-day monk. As mentioned, I can endure longer periods of meditation in the chamber -- the body does not ache as it often does when sitting -- that might be its most significant advantage. Perhaps, as one grows more familiar with it, one may experience a deeper exploration of inner realms. It was interesting how the mind upped the gain for sensory input in such an environment. One of the chambers is equipped with special video and sound devices for learning languages, aiding actors in learning their lines, or for the mental preparation of athletes, for example -- an interesting concept. I'm looking forward to further extended sessions.